The kitchen of a grand 1905 Neoclassical Revival home in Summit, NJ, was long on charm but short on the function required by its family of five. Since it was also located in the center of the home, the client did not want the kitchen to be the dark space the prior kitchen was during the cold winter months. The goal was to enlarge the space and bring in more natural light. Designer Heidi Piron had two significant challenges. Since the architect tripled its footprint, the first was to make it an efficient working kitchen that the client didn’t need roller skates to navigate. Second, in order to maximize the natural light, the client had to be willing to give up wall cabinetry space, which she was game to do. The client was not, however, willing to budge on her vision of a white kitchen. At first, Heidi tried to discourage her client from doing the white kitchen, since it’s such a safe choice. But the client held firm – she felt that the white, streamlined kitchen would complement the interior of the adjacent rooms, which made exuberant use of color. As it turns out, it was the client’s fearless taste which inspired Heidi to think big and be bold with white. Heidi first created two functional kitchens within the large footprint. 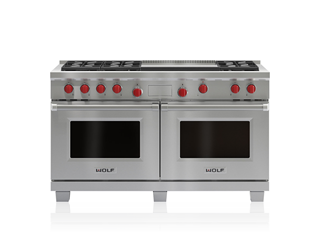 The working kitchen is built around a 60” Wolf dual fuel range – the perfect centerpiece, in both design and function. The other kitchen is a beverage center, with prep sink, refrigerator drawers and warming drawer, giving the family access to food and drinks without interrupting things in the working kitchen. Imagining that the house might have had a scullery when it was first built, Heidi also built in a floor-to-ceiling hutch with sliding glass doors for a stretch of wall at the back of the kitchen. It almost feels like it could be original to the house. 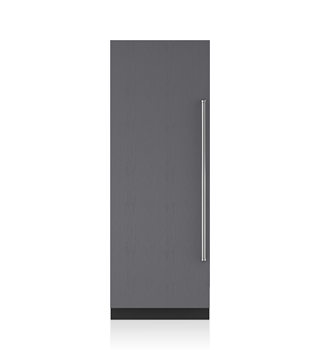 To reinvent the classic white kitchen, Heidi had Sub-Zero 30” refrigerator and freezer columns built into the wall, custom-designed with hefty icebox latches and hinges - a bolder, more modern take on the vintage style. To complement the look, she designed over-sized pulls, inspired by the iconic Walter Gropius pulls of the 1920s, for the cabinetry. She added open shelves to the wall of white cabinetry, so the homeowners could pop in color and personality. She found a stunning Calcutta marble with dramatic veining for the countertops, and chose a flat grain white oak floor that adds warmth to the room. The homeowners are delighted. 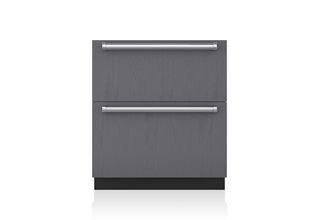 Now they can cook and entertain with ease, in a kitchen that is bright and inviting even in the darkest days of February.